Ok, this page is just for Fun. Nothing serious and nothing deep. We are not going to analyze the party goer or holiday antics. This page is open to everyone to post and share fun party holidays and vacation ideas. 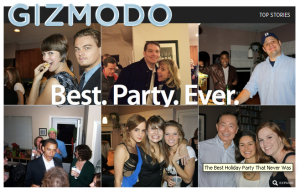 It’s a graphics tool that let you put celebrities, actors, rock stars and politicians into your party holiday shots. But it does look great to be rubbing shoulders with Di Caprio, Zac Efron, Kristen Stewart, Madona or Bianca. Get wild and go crazy!